thebackingboardfiles: Smuggler's bounty! 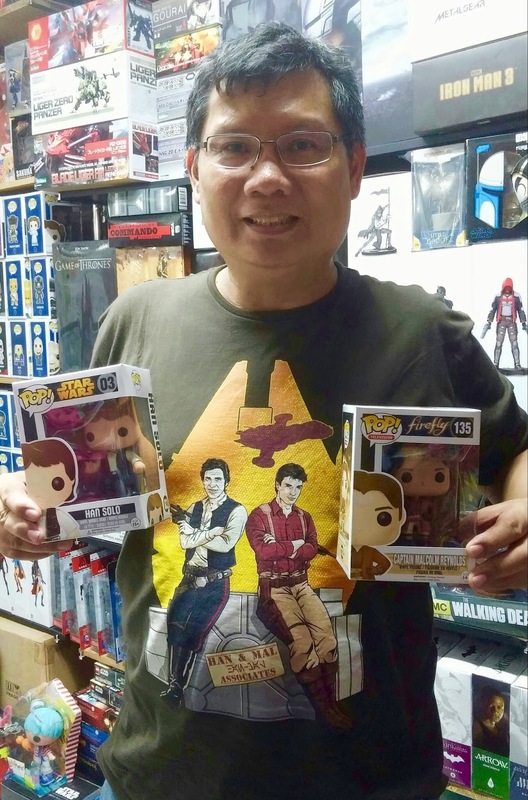 With my Han Solo & Mal Reynolds shirt & Funko Pops. Smuggler's bounty! With my Han Solo & Mal Reynolds shirt & Funko Pops. Never realized it until I saw this shirt. Two of my favorite science fiction characters -- Star Wars' Han Solo and Firefly's Mal Reynolds -- are space smugglers! Furthermore, they are captains of two of the best space ships ever -- the Millennium Falcon and the Serenity respectively. I have the DVDs of all the films/television series! Obviously, I had to get the shirt. As for the Funko Pops, it is a no-brainer to get them as well. So I posed with them!